"I have no idea." - Me. "Delicious egg salad." - Hubs. "Well that's random - I thought you were going to say Chinese..." - Me. Everyone seems to have their own version, just like they do with potato salad. It is one of those dishes that I remember hating as a kid, but now I could make it once a month and make a dinner out of it. My kid? Hates it. Since the hubs was craving it, I thought I would try making a really good egg salad. One superior to all the others I have made in the past (really they were just eggs, mayo, and mustard I think). 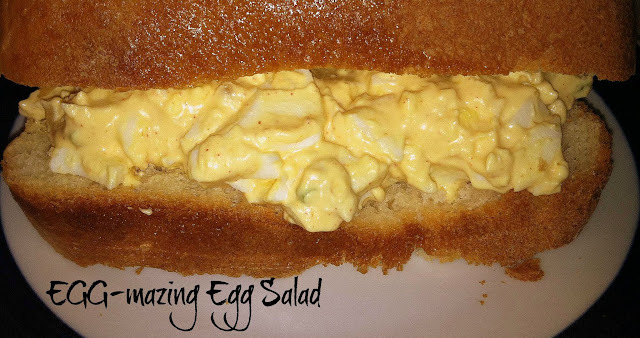 I was going to call it "egg-ceptional" egg salad, but I felt as that has been done too many times. "Egg-mazing" just seemed to fit this recipe better, in my opinion. I even went all homemade, fresh from the oven (aka breadmaker) warm bread! See my last post on how to boil the perfect eggs for this recipe also! Put the chopped eggs, green onion, and relish in a mixing bowl. Add the mayonnaise, salt, mustard, paprika, and sugar to the bowl and combine well with the eggs, green onion, and relish. Cover the bowl with a lid or foil and place in the refrigerator for a couple hours (at least two or three) to chill completely. Serve on sandwich bread or croissants. Store leftover egg salad covered, in the refrigerator for two days, beyond that it might get extra stinky!